What a whirlwind! 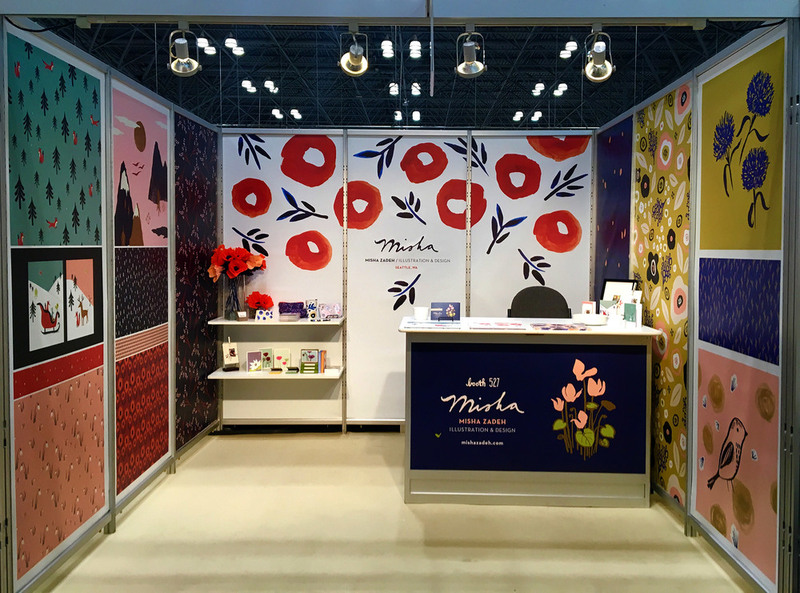 After months of preparation and weeks of working into the wee hours, my friend and project manager Gina and I descended upon the magic that is New York City to exhibit at SURTEX 2016. Great luck and a positive energy seemed to be with us the entire time, and I reflect upon that with utmost gratitude. The flight was great, everything for our booth traveled – and arrived – with us, our booth location was visible and surrounded by terrific neighbors, and setup took all of 4 hours! The show ran Sunday May 15th through Tuesday May 17th, with setup happening the 13th and 14th. Thanks to careful planning — and some pre-show coaching by my fabulous new Seattle friend and SURTEX veteran Diane Kappa — booth setup was a snap. Gina, Mia and I finished in record time and got to spend the remainder of Saturday afternoon and evening enjoying the city. Sidenote: The Highline is my special happy place. More related sidenote: Alphagraphics Seattle did a stellar job printing my banners, and I highly recommend them. 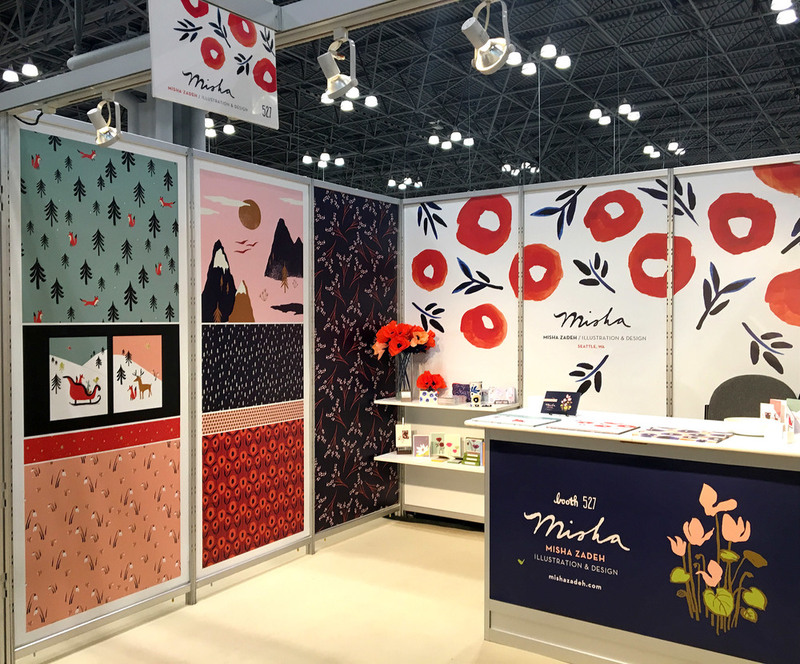 On Sunday, we walked into the Javits Center with bright eyes and high hopes, opened up for business…and were very warmly received! Visitors to our booth were very complimentary and mentioned that its design stood out and clearly conveyed my voice. After weeks of agonizing and redesigning my panels, I went with my gut instinct to be cohesive and simple. I was nervous about only showing a single design on 6 of my 9 panels, but as it turns out, that was one of the main things that helped the booth stand out. 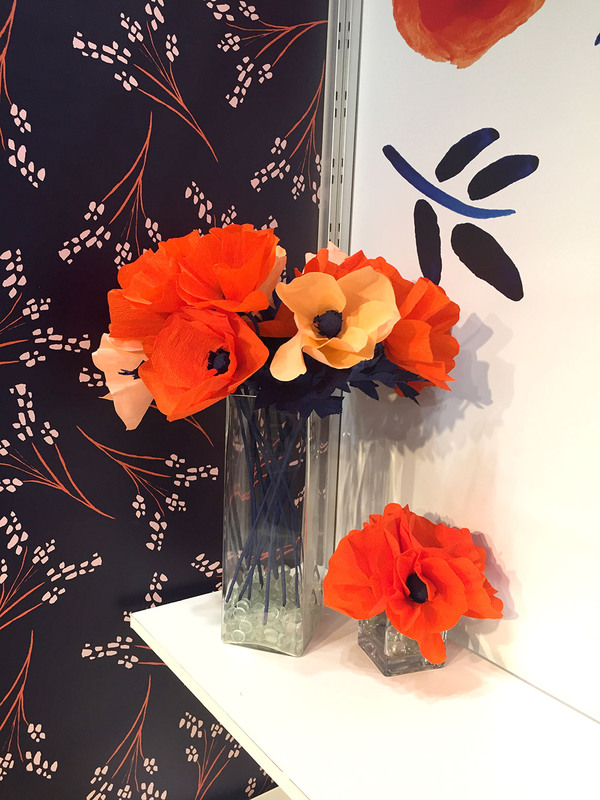 My booth design was a reflection of my overall aesthetic: clean and sophisticated with a bold use of color. I think the most successful booths were not necessarily the ones with closely aligned aesthetics to mine, but ones that clearly showed 'the brand' of the exhibiting artist(s) — whatever that may be. I had two helpers with me each day. My booth team was a dream, with many thanks owed to my Seattle-based friends Gina Alvino and Claudia Haon, and my NY-area peeps Mia Baudry and Shiva Sarram! Each brought her own gifts, talents, and support to booth 527. In terms of product categories of buyers who came into my booth, there were a lot of stationery people, a good number of housewares (both hard and soft goods), some bedding, some decor. Sadly, there were no representatives from the fabric or wall coverings industries. And, judging by comments of people wanting to dress their walls or themselves with some of my patterns, I will definitely be looking for clients in those fields on my own! Monday was the busiest day of the show, but we saw steady traffic throughout, with one key art director I was hoping to meet running in at 3:59 on Tuesday. Literally. 3:59! (Ok, It may even have been 4:02. The show officially closed at 4:00 pm and some of my neighbors had nearly finished dismantling their booths). One surprising and interesting experience was being selected to be interviewed at my booth by Karen LeBlanc of The Design Tourist for an upcoming segment she is preparing on SURTEX. I'll keep you updated once the clip is ready! Or maybe I won't. I hate watching myself on film! 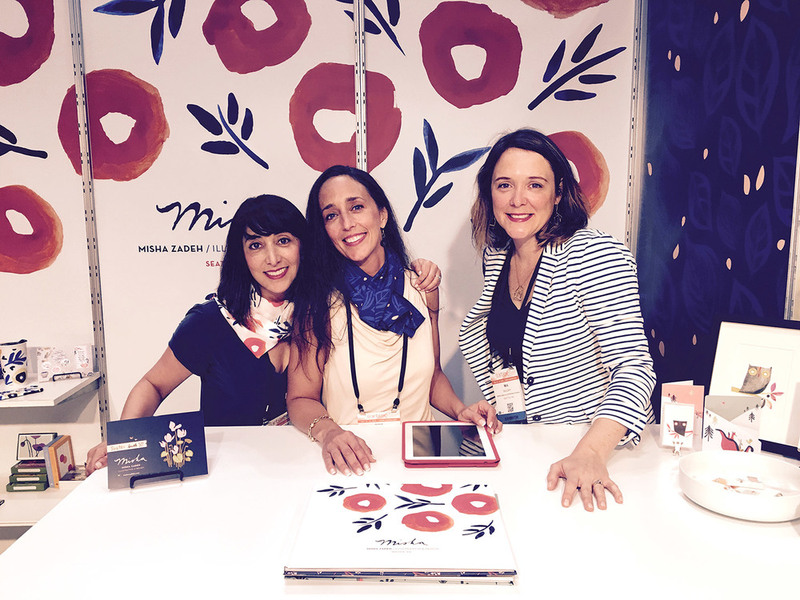 Conclusion: SURTEX 2016 was an absolutely terrific experience. I’m grateful for all the follow-ups I have to do and am hoping the good luck continues through to the deal signing and production phases. Also, in addition to making many new client contacts, I got to meet some wonderfully talented new artist and designer friends. There is a camaraderie in the surface pattern community that I haven't quite seen anywhere else. I'm so glad to be a part of this world! 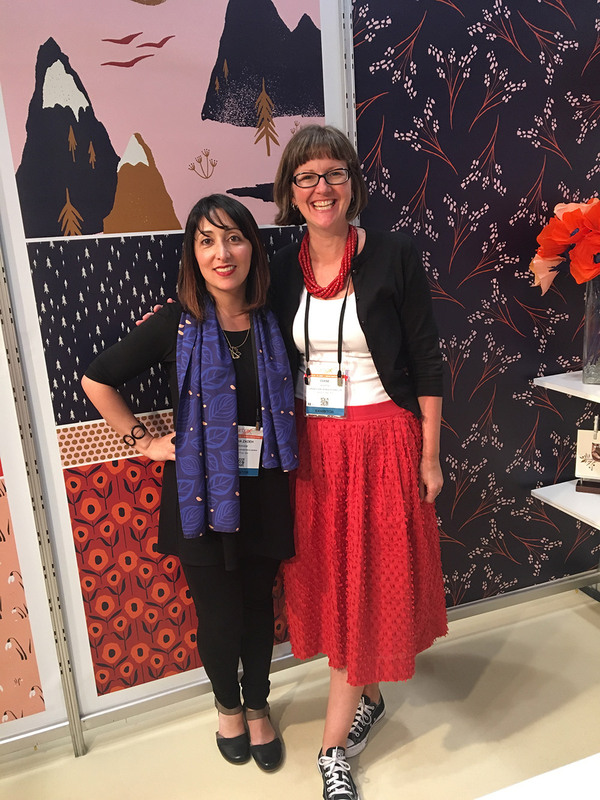 A special shoutout to Nicole Tamarin, another SURTEX veteran – and all around great person – for sharing her expertise via the SURTEX pre-show webinars, and for being so lovely in person! Thanks for reading. Were you there? Please leave comments! Have any questions you don’t want to leave in the comments? Email me and I’ll try to answer if I have time. Save up your money, do a regular sized booth, spring for some advertising (pre-show mailers, directory ads, ads in other trade publications...). Also, prepare some good takeaways (for instance, I had a tri-fold promo in addition to business cards and next year I think I'll do tote bags). SURTEX is a big investment. It's expensive. You don't have to do the show to make it in surface design. But if you go, make it count. If you don't want the financial or emotional responsibility of doing it alone, you could also exhibit as part of a carefully curated collective. Finch & Foxglove was a wonderful example of this. They pooled resources and each member of the collective brought their strengths to the table. Join the various surface design Facebook groups months before the show so you can start building up your tribe of fellow illustrators and surface pattern people. I’ve found them to be generous folks that are free with sharing their insights. These include Heart 2 Art Talk, Surtex Before and After the Show, Advice 4 Artists hosted by Jennifer Nelson (there is a waiting list - you must be vetted). Take a trade show prep course. If you've never done an art business related trade show, you might want to take an e-course such as Tradeshow & Tell by Khristian A. Howell. 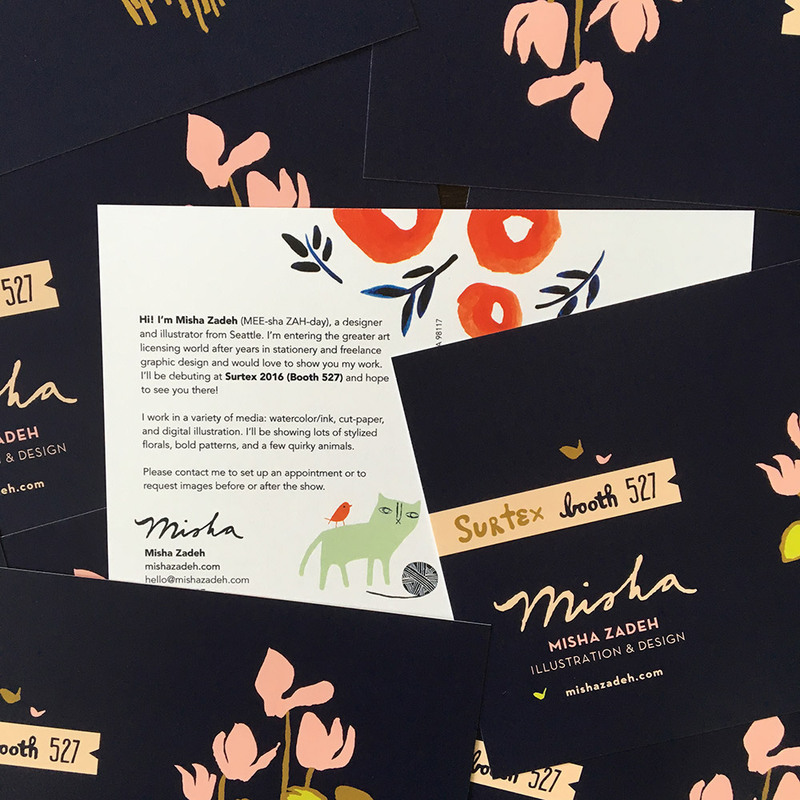 Although I had exhibited several times before at the National Stationery Show, there are some differences – SURTEX is much less intimidating, in my opinion – and Khristian offered some helpful tips and timelines. There is also an associated Facebook group that you will gain entry to upon enrolling in the course. You will learn lots from the members of these groups! For those of you doing the Stationery Show, I've heard great things about Katie Hunt's Tradeshow Bootcamp. Don't do it alone. I feel strongly about this. Having a team presents a more welcoming atmosphere in your booth and gives you a chance to take breaks and refresh. If you must head to SURTEX on your own, join the groups listed above and start soliciting helpers early on. Lots of artists will get themselves to NY on their own dime to work at your booth in exchange for a show pass (a $495 value!) and the opportunity to learn by helping you exhibit. I would have LOVED to do this last year. I paid the fee and walked alone because I was not connected yet. Have an awesome portfolio system. I created Blurb books and was extremely happy with the results. I chose the pro matte paper, and the quality is superb. The turnaround time is also pretty fast if you are west coast based. I created my own layout in InDesign (which was a TON of work) but I think it looked very professional and was worth every penny and hour. Coordinate with your booth. Dress as if you are part of the whole well-designed booth plan. You don't have to create outfits made of your own custom fabrics (though that doesn't hurt), but at least wear complementary colors and/or neutrals. This goes for your booth helpers. We did this, it was seamless, and made for great photos. It was fun to see how many booth visitors coincidentally matched the booth, too. Create a separate grouping of art for outright sale. I know lots of people said this to me but I wasn’t ready for it. Having an offering of prints you want to sell outright will make you feel like you've recouped some costs right away. Many buyers only buy outright, which is a tad annoying as SURTEX is primarily a licensing show, but, it seems to be a trend. When creating this art, avoid characters or artwork that is super precious to you and/or that has lots of coordinates. Smile! Be yourself — but push yourself to be outgoing if you are not. SURTEX is a highly social event. If you are an introverted person, this is even more reason to bring someone with you who is not. You are 'on' for three days straight. I found this exhilarating. Would you?